I also came into possession of a GoPro Wide camera recently. Bottom line? I agree with all of HBC’s findings in Part I of this review. The GoPro Wide is super-easy to use right out of the box and the wide angle lens is way better than the narrow field of view offered by other cameras. 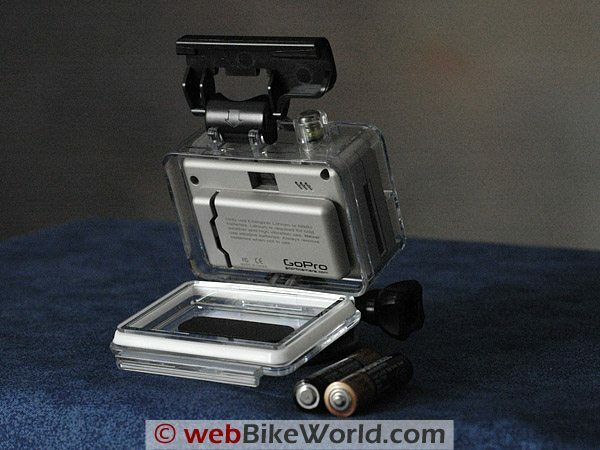 It also think the GoPro Wide has probably the best selection of camera mounts provided with any motorcycle videocam we’ve reviewed. My feeling is that the megapixel and zoom capabilities of modern digital cameras are too often deviously exploited by camera manufacturers to persuade the average consumer to buy the “better” camera. More pixels, more zoom, better, right? Wrong! Apparently it’s easier to use these raw numbers and the “bigger is better” approach than it is to use more complex data to convince consumers that one camera actually produces better quality photos than the competition. The really important camera features like image quality, accurate color reproduction, noise at high ISO ratings, resolution, pincushion and barrel distortion are much more esoteric topics that would take too much work for the consumer to understand. Yet these are the features that, in the end, will make the most difference to the photographer. But even the point-and-shoot snapshot taker who couldn’t care less about those specifications will immediately recognize what those specifications do for the quality of a photo when they see it in print. At least the megapixel wars have slowed a bit. I can make a very good argument that 7 MP is more than necessary for excellent prints (and way more than necessary for 72 dpi web photos). Also, processing a 12 MP+ photo will take more memory, more computer horsepower and, in general, result in a less satisfactory photo. But the latest trend seems to be monstrously huge zoom range. For example, the new Canon PowerShot SX1 has a 28-560 mm zoom and the recently announced Sony DSC-H20 a 38-380 mm. I’d also argue that the wide end of these zoom ranges is much more useful to the average consumer, who is more apt to take photos of the family in poor lighting conditions indoors. A wide angle lens with good light gathering capabilities (i.e., a “fast” lens of f2.8 max) and low noise at high ISO is key. Long focal lengths, even with image stabilization, usually mean “slow” f-stops at the long end of around f5.6 or so, and most consumers simply won’t be using such extreme zoom capabilities. And it’s a double whammy, because those long zooms usually mean one or two stops slower at the widest end also. But bigger numbers must mean a better camera, right? A relatively wide field of view is doubly important for taking motorcycle videos. 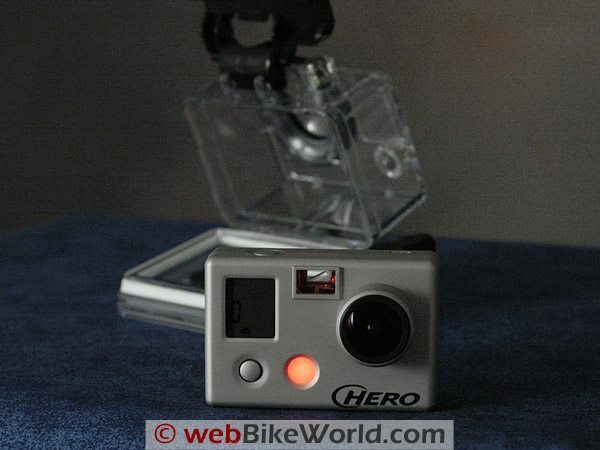 The original GoPro (review) and the Oregon Scientific action camera (review) and the VholdR (review) seem to provide a narrower field of view, which make mounting a much more critical and difficult task. 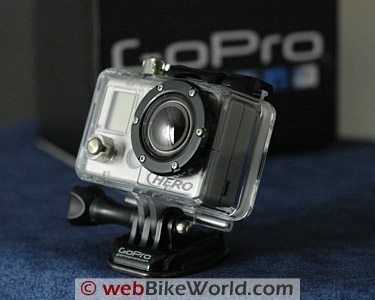 The wide angle lens on the new GoPro Wide is perfect for edge-to-edge road work on a motorcycle. Just remember the age-old tips from the pros — keep wide angle lenses as parallel to the ground as possible for the least amount of barrel distortion — unless that type of distortion is desired for stylistic reasons. The wide angle lens on the GoPro Wide seems to offer about the same perspective as a 14 mm lens on a 35 mm camera. I compared photos taken with the GoPro Wide and a 35 mm Nikon D200 with a Tamron 12-14 mm lens mounted. From the same camera location, the view and perspective in the resulting photos was about the same. The red light turns on briefly when the camera is started and it blinks when recording video. NOTE: This is the first wBW video posted in HD! Be Careful With That Lens! One problem that wide-angle lens owners have always faced is keeping the lens clean and scratch-free. Many 35 mm wide angle lenses — like my Tamron 12-14 mm — have a curved lens surface that invites fingerprints, dirt and, heaven forbid, scratches. So I wish there was some sort of lens protector on the GoPro Wide — owners should be very careful not to touch the “fish eye” lens protruding from the front of the camera body. Of course, it’s always good practice to take special care with camera lenses, but the lens on the GoPro Wide has an anti-reflective coating that is a magnet for fingerprints. Since the camera can be adjusted while it’s in the waterproof housing, it’s probably a good idea to keep it in the housing as much as possible. Care should be taken also when opening the waterproof housing; the camera can easily slide out of the housing when the door is open, and you don’t want the camera to fall out on the ground and potentially damage the exposed lens. These old eyes have a very difficult time viewing the icons on the fingernail-sized LCD on the front of the camera. The icons are referenced on the instruction sheet (printed in 5 languages), and it takes some study to figure it all out. I leave mine on the default settings and use it for video only — I still have to refer to the instruction sheet to remember how to take still photos. The large clear plastic box that holds the camera in the packaging seems to me to be a missed opportunity. It’s certainly not “green” packaging and probably wasn’t necessary. The camera housing is stuck to the bottom of the display case with double-sided tape, but mine came loose during shipping and I could hear the camera banging around deep inside the box as the FedEx carrier handed it over. Although the clear display box might look good in the store, I’d rather see a more environmentally sound container that would serve double duty as a camera and accessories storage box later on. I’m always surprised that manufacturers of various consumer goods — and especially electronics and cameras — don’t design the container to also serve as the storage unit for the owner.